Terry L. Gustafson is Professor of Chemistry and Special Assistant to the Executive Dean for Semester Conversion for Arts and Sciences. He also serves as the Director of the Center for Chemical and Biophysical Dynamics in the Department of Chemistry. He received his B.S. in chemistry and physics at Moorhead State University (MN) in 1975 and his Ph.D. in chemistry from Purdue University in 1979. 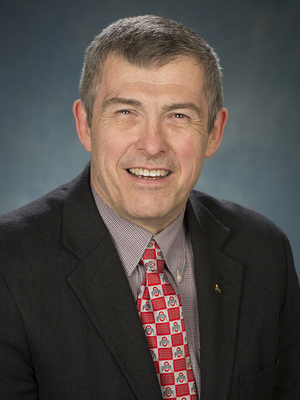 He worked for nine years at Sohio Research and Development (later BP America Research and Development) before joining the faculty at The Ohio State University in 1989. He has been a Visiting Professor in Japan and in France. He serves on the International Organizing Committee for the International Conference on Time-Resolved Vibrational Spectroscopy. He was presented with the John T. Mount and Ruth Weimer Mount Award in 2000 for outstanding service to The Ohio State University and its students. In 2001 he was presented with the Honors Faculty Service Award by the Colleges of the Arts and Sciences and the Outstanding Teaching Award by the Arts and Sciences Student Council. He has also been selected by students to be an honorary member of Mirrors and Sphinx, two of the student honorary societies at The Ohio State University. He currently serves as an advisor to Sphinx. The primary focus of our research efforts is the elucidation of th estructure and dynamics of photo-generated transient species. We have concentrated on two important photochemical systems: relaxation processes in organic electronic materials and energy and electron transfer in optical materials for solar energy conversion. A common thread that is emerging from our studies is the role of molecular conformation in determining both the chemical reaction pathways and the subsequent dynamics. Research in organic polymer materials for use in flexible Light EmittingDevices (LEDs) was initiated by the discovery of electroluminescence in poly(1,4-phenylenevinylene) (PPV). As a consequence of this discovery, increased attention to conducting polymers has produced many advances in the development of light emitting devices and polymer lasing media. In general,there is a strong correlation between electroluminescence and photoluminescence. Our research involves understanding the relationships among molecular structure, photoluminescence, and the photophysics of these materials in order to predict the luminescence behavior and to control the electroluminescence properties at the molecular level. Photosystem II (PS II) is a protein-pigment complex that catalyzes thelight-dependent oxidation of water. Chlorophylls present in the PS II complex function in energy harvesting or as the primary electron donor during charge separation. Charge separation initiates electron transfer in the PSII reaction center resulting in the removal of electrons from water and release of molecular oxygen. The mechanism for energy and electron transferin the PS II reaction center is not well understood and remains an active area of research. Site-directed mutagensis has proven to be a valuable tool in gaining further insight into the functionality of the PS II reaction center. We are using a variety of time-resolved spectroscopies to probe energy and electron transfer in wild type and mutant PS II reaction centers. We use pulsed lasers (10-13 to 10-9 seconds) to probe the initial photophysical processes in these systems. Transient absorption and time-resolved fluorescence are used to probe the electronic relaxation processes. We also use transient Raman spectroscopy and time-resolved infrared spectroscopy to probe the vibrational spectra of transient species. Vibrational spectroscopy gives direct structural information about conformational relaxation of intermediates and transient species. Wang, J.; Burdzinski, G. T.; Gustafson, T. L.; Platz, M. S. “Ultrafast Study of p-Biphenylyldiazoethane. The Chemistry of the Diazo Excited State and the Relaxed Carbene,” J. Am. Chem. Soc. 129, 2597-2606 (2007). Wang, J.; Kubicki, J.; Burdzinski, G. T.; Hackett, J. C.; Gustafson, T. L.; Hadad, C. M.; Platz, M. S. “Early Events in the Photochemistry of 2-Naphthyl Azide from Femtosecond UV/Vis Spectroscopy and Quantum Chemical Calculations. Direct Observation of a Very Short-lived Singlet Nitrene,” J. Org. Chem. 72, 7581-7586 (2007). Wang, J.; Kubicki, J.; Hilinski, E.; Gustafson, T. L.; Platz, M. S. “Ultrafast Study of 9-Diazofluorene: Direct Observation of the Excited Singlet Carbene,” J. Am. Chem. Soc. 129, 13683-13690 (2007). Chisholm, M. H.; Chou, P.-T.; Chou, Y.-H.; Ghosh, Y.; Gustafson. T. L.; Ho, M.-L. “Preparations and Photophysical Properties of Fused and Non-Fused Thienyl Bridged MM (M = Mo or W) Quadruply Bonded Complexes,” Inorg. Chem. 47, 3415-3425 (2008). Wang, J.; Kubicki, J.; Gustafson, T. L.; Platz, M. S. “The Dynamics of Carbene Solvation: An Ultrafast Study of p-Biphenylyltrifluoromethylcarbene,” J. Am. Chem. Soc. 130, 2304-2313 (2008). Burdzinski, G. T.; Wang, J.; Gustafson, T. L.; Platz, M. S. “Study of Concerted and Sequential Photochemical Wolff Rearrangement by Femtosecond UV-Vis and IR Spectroscopy,” J. Am. Chem. Soc. 130, 3746-3747 (2008). Wang, J.; Burdzinski, G. T.; Kubicki, J.; Gustafson, T. L.; Platz, M. S. “Ultrafast Carbene - Carbene Isomerization,” J. Am. Chem. Soc. 130, 5418-5419 (2008). Hauser, A. J.; Zhang, J.; Mier, L. M.; Ricciardo, R. A.; Woodward, P. M.; Gustafson, T. L.; Brillson, L. J.; Yang, F. Y. “Characterization of Electronic Structure and Defect States of Thin Epitaxial BiFeO3 Films by UV-visible Absorption and Cathodoluminescence Spectroscopies,” Appl. Phys. Lett. 92, 222901-1-3 (2008). Burdzinski, G. T.; Chisholm, M. H.; Chou, P.-T.; Chou, Y.-H.;Feil, F.; Gallucci, J. C.; Ghosh, Y.; Gustafson, T. L.; Ho, M.-L.; Liu, Y.; Ramnauth, R.; Turro, C. “The Remarkable Influence of M2δ to Thienyl π Conjugation in Oligothiophenes Incorporating MM Quadruply Bonds,” Proc. Natl. Acad. Sci. USA 105, 15247-15252 (2008). Alberding, B. G.; Chisholm, M. H.; Chou, Y. H.; Gallucci, J. C.; Ghosh, Y.; Gustafson, T. L.; Patmore, N. J.; Reed, C. R.; Turro, C. “Quadruply Bonded Dimetal Units Supported by 2,4,6-Triisopropylbenzoates MM(TiPB)4 (MM = Mo2, MoW, and W2): Preparation and Photophysical Properties,” Inorg. Chem. 48, 4394-4399 (2009). Alberding, B. G.; Chisholm, M. H.; Gustafson, T. L.; Reed, C. R.; Singh, N.; Turro, C. “[Bis(trispivalatodimolybdenum (II))-m-bis(4'-carboxylato-2,2':6',2''-terpyridine) ruthenium (II)] (2+) Tetrafluoroborate: Photophysical Studies,” J. Cluster Sci. 20, 307-317 (2009). Alberding, B. G.; Chisholm, M. H.; Ghosh, Y.; Gustafson, T. L.; Liu, Y.; Turro, C. "Sexithiophenes Mediated by MM Quadruple Bonds: MM = Mo2, MoW and W2," Inorg. Chem. 48, 8536-8543 (2009). Alberding, B. G..; Chisholm, M. H.; Chou, Y.-H.; Ghosh, Y.; Gustafson, T. L.; Liu, Y.; Turro, C. "2-Thienylcarboxylato and 2-Thienylthiocarboxylato Ligands Bonded to MM Quadruple Bonds (M = Mo or W): A Comparison of Ground State, Spectroscopic and Photoexcited State Properties," Inorg. Chem. 48, 11187-11195 (2009). Alberding, B. G.; Barybin, M. V.; Chisholm, M. H.; Gustafson, T. L.; Reed, C. R.; Robinson, R. E.; Patmore, N. J.; Singh, N.; Turro, C. “Molecular, electronic structure and spectroscopic properties of MM quadruply bonded units supported by trans-6-carboethoxy-2-carboxylatoazulene ligands,” Dalton Trans. 39, 1979-1984 (2010). Alberding, B. G.; Chisholm, M. H.; Gustafson, T. L.; Liu, Y.; Reed, C. R.; Turro, C. “Photophysical Studies of trans-Bis(phenylethynyl-diisopropylamidinato)-bis(acetato) dimetal Complexes (MM) where M = Mo or W,” J. Phys. Chem. A, submitted for publication.